Batman Day is almost here, and… Uh boy. Well, we at Cat-Tales had what we thought was a nifty idea getting our little stable of Rogues together to send a congratulatory message celebrating 75 years of the Bat they love to hate. So far, it’s not quite working out the way we planned. Their a self-absorbed lot and the concept of other people, even sending a message to other people, doesn’t always register. Bane-shaming, is that a thing now? 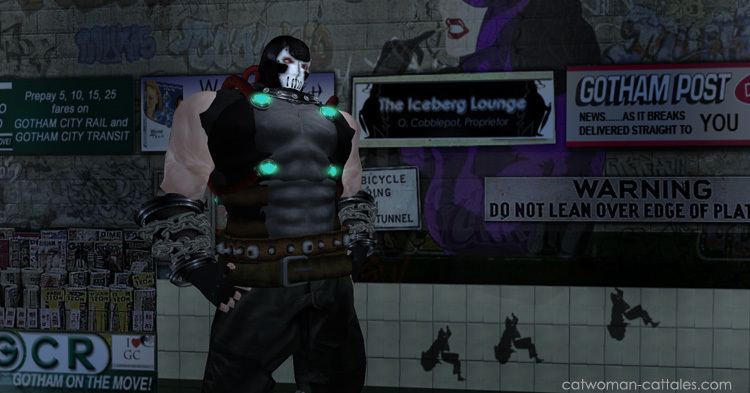 First we have Bane, who somehow keyed into the idea of holding a sign being a shame sign and deciding to shame himself. 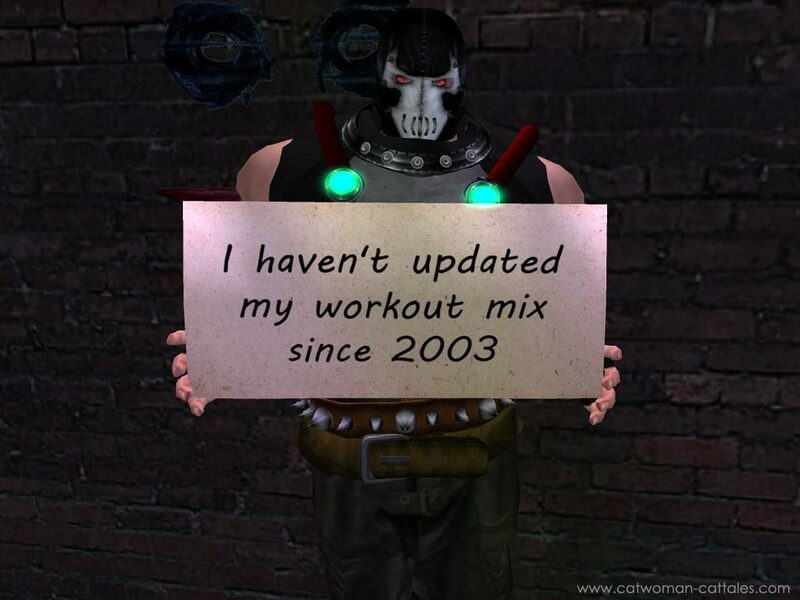 About his workout mix. That came in #413 on our list. Harley Shaming really should be a thing. Okay, none of us really expected her to get it, now did we? A chess set fashioned after the Gotham Rogues, undoubtedly a creation of The Z. Riddler used it as a snappy little prop/conversation starter for a sitdown with Batman in (fittingly) The Gotham Rogues when Joker, Poison Ivy, Clayface and the others were his weapons in the war with the Gotham mobs. Behind Batman’s mask, Bruce looked up sharply. It was a shockingly brilliant analysis. Eddie shook his head, dissatisfied with the idea. 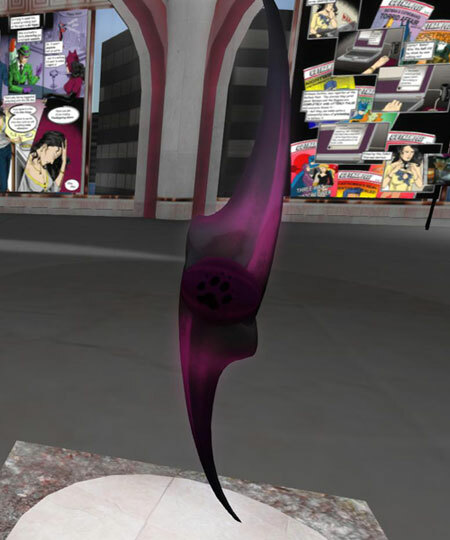 Too tantalizing to retire, it showed up again in Inside an Enigma, and now it’s back again – this time on display in the Cat-Tales Virtual Visitor Center in Second Life. Also on display, a Catarang. In Not My Kink Catwoman takes over Batman’s patrol while Bruce recovers from an injury (in Armchair Detective). By Week 5, she’s earned a little gift. I never realized he made the first batarangs himself. I’ve used Kittlemeier from day one for my things. But this, he made it himself. Such a sweet scene. Of course the deceptively idyllic moment couldn’t last, but that year the chapter that was “a short and sweet taste of life in the Batcave” made a Christmas present for readers who hadn’t had a holiday tale for quite some time. Both items are on display for a limited time Virtual Visitor Center. Bane was introduced in Cat-Tales in Chapter 4 of Comedy of Errors. He’s discovered at Ramon’s Café & Bar Lounge in Lubbock, Texas. I asked a friend in that part of the country for a location that “wasn’t the absolute end of the world, but you can see it from there,” and that’s how Ramon’s and the Banester himself came to reside in Lubbock. At the time of that first interview, those few scenes were all we had seen of Bane, but I knew what was coming. Storm clouds were forming over Gotham, there was a war coming between the Rogues and the Mobs, and it was Bane and not Carmine Falcone who would wind up being the major antagonist. 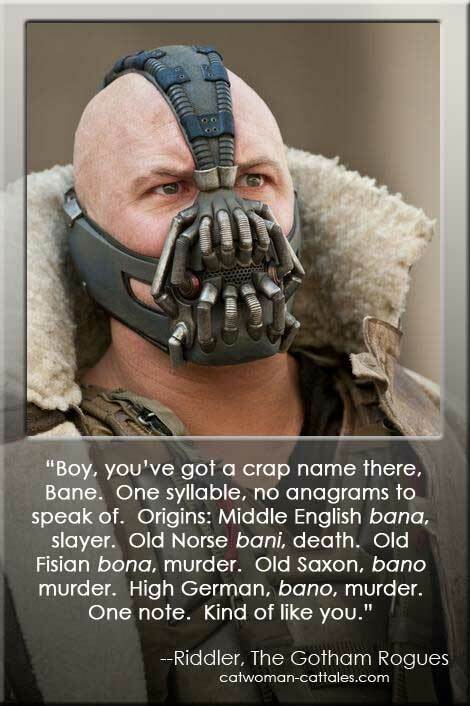 Now, I’ve never been one to play the spoiler game, but if I had known going in that Bane’s name would come up, I might have come prepared to drop a hint or two. Having missed that opportunity, I will say here that while the man himself is no longer in Gotham, and while his appearance in the Tales was obviously to play along and have some fun with The Dark Knight Rises dusting off the big hulking steroid case, nothing in Cat-Tales Gotham happens in a hermetically sealed package that begins with the first sentence of chapter 1 and ends with the final period. Pebbles were dropped in The Gotham Rogues and the ripples from those pebbles are still moving through the waters of Inside an Enigma. Final thought. While I badly want to go out on the Guns n’ Roses, I simply can’t hold off on saying this: Eddie was right. Do you know how hard it is to come up with a cute, punny title related to Bane? 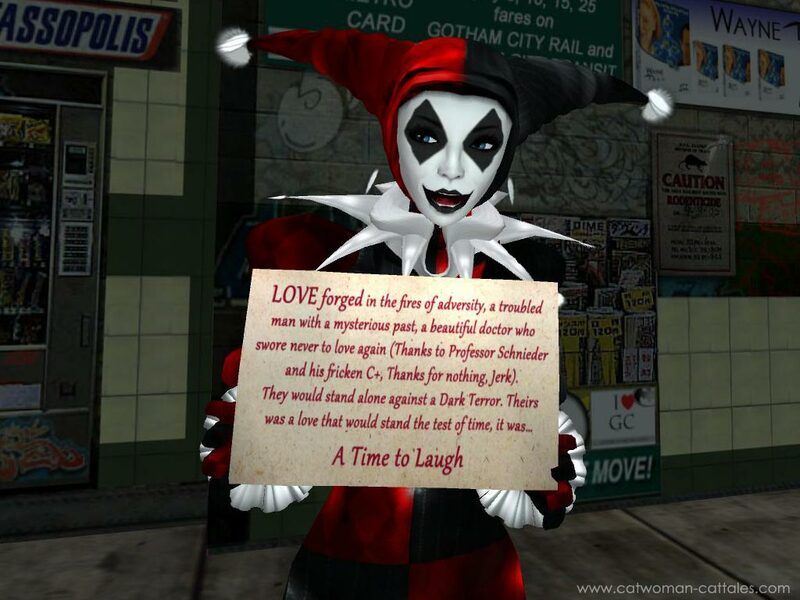 I wanted to title this entry something quippy and clever, but there’s not a Don’t Fear the Joker or Riddle Me-Tropolis to be had with him. The Gotham Rogues ebook and print-quality pdf is done and ready for download on the cat-tales website. I’ve got mobi format for Kindle readers and epub, the universal ebook format should work for everyone else. PDF for printing. Long before they were a football team, they were The Gotham Rogues. Carmine Falcone liked to think of himself as The Godfather, and nothing said Godfather like a big mob wedding. Bane liked to think of himself as ‘The Man Who Broke Batman,’ entitled to all the respect and homage of that achievement. You don’t trash their dreams without consequences, even if you’re The Gotham Rogues. It all began… Boy, how did it begin? Oh yes, a 40,000 carat fiberglass “diamond” taken as a trophy for the Batcave, a runaway chain of misunderstandings about Bruce Wayne getting engaged to Selina Kyle—which led the Gotham Rogues to trash the wedding of Carmine Falcone’s godson and led Batman to track down Bane, setting off years of pent up rage.